Home > Mind > Quiz: Are You Using Your Brain or Losing It? We all want to keep our minds young and active as we get older – and try to prevent the development of degenerative mental diseases like Alzheimer’s. In particular, we really fear losing our memories because our ability to remember things helps to give us a sense a security about who we are, what role we play in society, who we can rely on and what we can do. Naturally, some memory loss is common with ageing but by doing exercises to work your memory, you can slow the ageing process. Unlike what most people think, memory doesn’t depend on how much your brain can store but rather on how well you can retrieve information. With good lifestyle habits which exercise your brain via specific activities, you can reduce the amount of deterioration in the neural processes which control information retrieval. So are you Exercising your Brain Enough? 1. Do you sometimes try to memorise a number rather than always relying on your mobile phone contacts list or your address book? 2. Do you sometimes try to brush your teeth with the other hand? 3. Do you vary the routine when you get up in the morning, leave the house for work or get ready for bed? 4. When you go someplace new, do you also notice what it smells like, sounds like, feels like…rather than just what it looks like? 5. Do you play board games regularly? 6. Do you do crosswords regularly? 7. Have you learnt a new language or skill in the past 6 months? 8. Do you sometimes use memory tricks, like 'chunking' to help you remember things? 9. Are you fairly organised? 10. 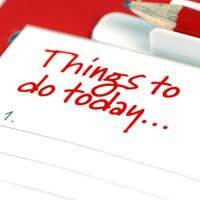 Do you make ‘To Do’ lists and write other important notes down? 11. Do you exercise regularly? 12. Do you take part in activities, such as a relaxing hobby, listening to music or socialising with friends – which help you de-stress? 13. Do you eat a diet high in antioxidants? 14. Do you get enough sleep? If you were not able to answer 'Yes' to every question then you have some brain boosting work to do! Your diet, activity levels and lifestyle can have a significant impact on your memory abilities and brain function. Make sure your diet is high in foods that promote brain function, such as nuts & seeds, spinach and other dark leafy greens, oily fish, berries, sweet potatoes, citrus fruits, broccoli, red tomatoes, black beans and other legumes, liver and green tea. Getting enough sleep and regular exercise is also very important in keeping your brain healthy. Keep your mind stimulated by regularly playing games or doing puzzles, whether it is a weekly crossword, a traditional game of chess or one of your favourite childhood board games – they are all good. Social games, like Bingo, can also be very beneficial. In many cases, the incentive of winning can make us work harder and stimulate our brains more. Don’t ever stop learning. Whether you decide to take up a new language or a DIY skill or any other form of hobby or ability, learning new things is a fantastic way of keeping your brain fit and flexible and your memory in top working order. Writing things down is actually not a sign of poor memory ability – instead, it helps to imprint things in the brain and helps in information organisation and retrieval. Being organised in general will also help to improve your memory. Finally, keep your stress levels under control with relaxing activities. Stress hormones, like cortisol, can damage parts of the brain if it remains in the body at high levels – and can lead to you being easily confused or frequently forgetting things. Research suggests that keeping your brain active can reduce the rate your brain shrinks by half. So treat the brain like a muscle – and use it or lose it!